Ex Libris: Gratitude Giveaway is on its way! 2) to reward you with some great prizes! 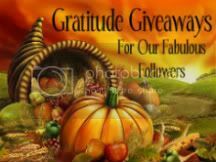 ps: for details about the giveaway hop click on the banner.